The perfect grilling squash with caramelized, nutty taste and creamy flesh. Squash-lovers, meet the griller of your dreams. 'Green Eggs’ dishes out slice after delicious slice of flavor. Gorgeous, green, 5” oval squashes are ready to leap onto the grill and dazzle you with caramelized, nutty taste and creamy flesh. Green sister to ‘Golden Egg’ is likewise a great vegetarian/gluten-free option. Reduced spine plants are high-yielding, with an 8-week harvest. 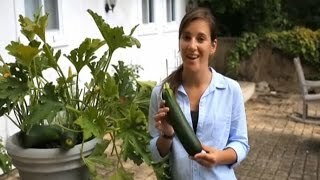 Growing squash &amp; zucchini in containers on your deck, porch or patio! Shaped like a cupcake with sweet flavor and soft skin. Sow seeds directly in the garden in fertile, warm soil in full sun after danger of frost has passed. Be sure to choose an area when you did not plant squash or related crops within 2 years. Sow 1-2 seeds about 36 inches apart. Cover with 1 inch of fine soil. Thin to one plant when seedlings have two sets of leaves. Squash plants have a shallow root system, mulches help retain soil moisture and maintain even soil temperatures. Squash plants have both male and female flowers on the same plant. Male flowers will open first and the female flowers will open later. Attract bee pollinators by planting daisies such as sunflowers, cosmos, zinnias and coneflower, and mints such as beebalm, sage, oregano and lavender. More bees mean more chances flowers will be pollinated and develop into fruits. Border squash plots with rows of beans, herbs, peppers and tomatoes. Harvest when fruits are small and the skin is shiny. Harvest often. To keep summer squash producing pick all fruit at this stage. If fruit is allowed to mature the plant may stop producing. To pick summer squash give the fruit a gentle twist until it snaps off. Store summer squash in plastic bags in the refrigerator for up to a week. Male squash blossoms are also delicious and sweet, try dipping in batter and frying. Wait to until the fruit has matured to harvest. Fruit will have a dull skin that is too hard to pierce with your thumbnail. To harvest, cut fruit from the vine with shears leaving a 2- 3 inch stem on each squash. Allow winter squash to cure in the sun for a week to harden skin. Store winter squash in a cool dry place. Squash, Summer, Green Eggs Hybrid is rated 4.3 out of 5 by 6. Rated 1 out of 5 by Puggarden from Big disappointment I was so excited for these, but what a bust! The plant looked great but the squash never grew larger than my finger. My other zucchini, nearby and treated the same, is doing great. I'm not sure what went wrong with this variety but I am disappointed. 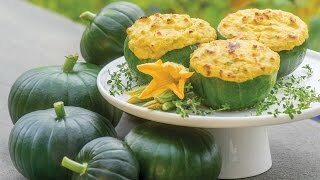 Rated 5 out of 5 by Kerm from Green Egg Excellent squash! Wonderful taste and very good harvest from seeds. Rated 5 out of 5 by Jakers from Love these! I absolutely love these. They are growing awesome, easy to harvest. One is just the right amount to cook for two people. I have the yellow ones too which are also growing well. I think the taste is better than traditional zucchini but have not done a side by side taste so unsure of how the traditional zuke tastes this year. BTW traditional Zucchini is growing well this year too so unsure if this is just a good weather year. Very happy with these and will grow again in years to come! Rated 5 out of 5 by Sofiecat1 from Green Eggs Hybrid Squash We love this squash. Fantastic on grill. We have shared with friends & family & everyone asked for more. Rated 5 out of 5 by Chas P from #1 Grillers These are great for grilling. A lil Olive Oil and S&P then grill. even though they are big and round the seeds aren't a factor with this type. You can also make zucchini pizzas. YUMMO!